Cross stitch Needle (Size) Guide. Tapestry needles come in a wide variety of sizes. The larger the size number is, the smaller the needle. Tapestry needles come in a wide range of sizes. The needles shown here range from Size 28 (the smallest) to size 16 (the largest). Tapestry Needles are available in up to size 13. The size of the needle used for a project depends on the fabric count. For large count Aida fabric, a large needle such as a size 18 needle may be used. For fine linen and evenweave fabrics, a tiny size 28 needle may be needed, especially if the design includes petite cross stitch. The tapestry needle chosen for each project should be large enough to push aside the fibers of the fabric. The needles and threaders we stock are quality Pony brand items. 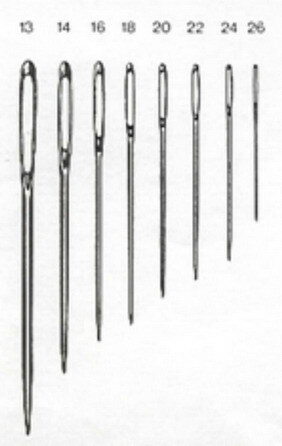 Cross stitch needles have a large eye and rounded point - they are also know as tapestry needles. They are used for counted thread embroidery including cross stitch, blackwork, hardanger and long stitch. Gold plated cross stitch needles are ideal for stitchers who have an allergy to nickel - they slide through the fabric easily and are also less prone to rusting. We stock gold plated cross stitch needles both loose and individually wrapped. Beading needles are slim needles with small eyes. Use these when adding beads to your design. Beads are used to enhance and decorate - seed beads can also be used in place of French Knots. The specific needle to choose depends on the embroidery technique, the floss or yarn used and the fabric being stitched. A number represents the size of the needle: the higher the number, the smaller the needle. 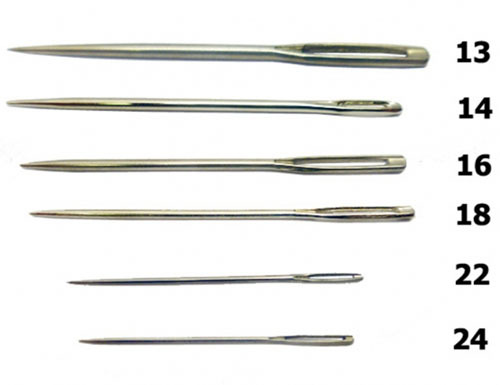 All of these types have larger eyes than regular sewing needles, a must for using with floss. Crewel (embroidery) needles are sharp pointed and range in size from 1 to 10. These are used for standard embroidery stitched on common fabric such as stamped designs on pillow cases, towels, etc. 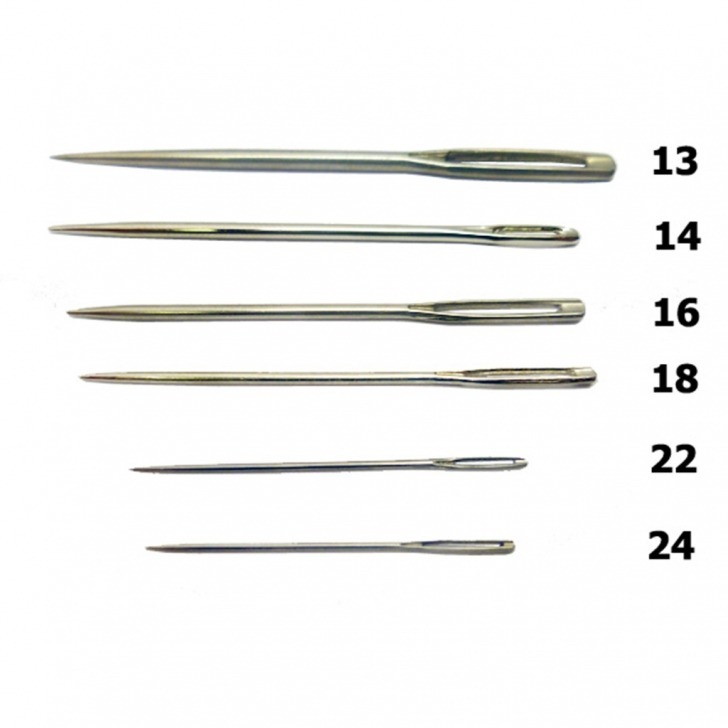 Chenille needles are also sharp pointed and range in size from 13 to 26. Longer, thicker and with larger eyes, these make a good choice for embroidery with heavier yarn. 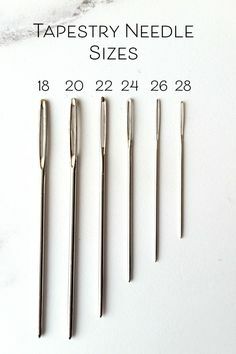 Tapestry needles also range in size from 13 to 26. Blunt rather than sharp, these make an ideal choice for counted cross stitch. They receive my nomination for the title, "cross stitch needles." The purpose of a cross stitch needle is to open the weave of the fabric so the floss can easily pass through. If the needle is too small, the floss will fray a little more each time it is pulled through the cloth. On the other hand, too large a needle can can distort the small holes in any even weave material (such as Aida cloth) with a thread count higher than 18. I use Tapestry needles, size #26, almost exclusively. The blunt tip works perfectly for "finding" the hole by feel. Sharp needles so easily pierce the fabric that I typically keep stitching and do not realize the mistake until I come back and stitch adjacent to it. The blunt tip of the tapestry needle helps avoid this problem. 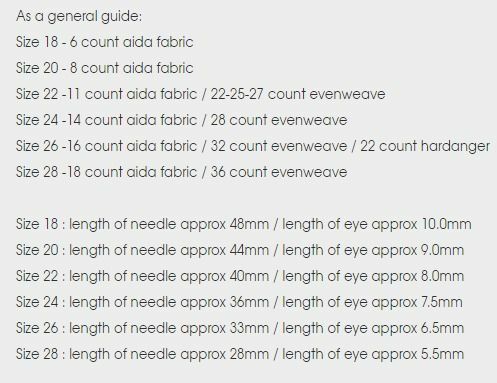 Try to avoid the frustration of having multiple needle sizes to sort through when stitching. Since I most often use cloth between 11 and 18 count, I've found the #26 needle to be the most versatile choice. I also keep a few of the next larger #24 on hand to use when I have too many strands of floss to easily thread through the eye of a #26, or when using specialty metallic floss.